This is not an exhaustive list of print cost calculators and royalty structures for print-on-demand services by any means, but it does focus on the top two: Amazon KDP (formerly CreateSpace) and IngramSpark. Each of these services allows you to order 1-up-to-mass-quantity of your books, shipped directly to you for your own marketing strategy, or you can use these services to integrate your book into Amazon, bookstores, and libraries. Each website is just a little different than the others. For instance, Amazon KDP (formerly CreateSpace) has its pricing segmented under different tabs. 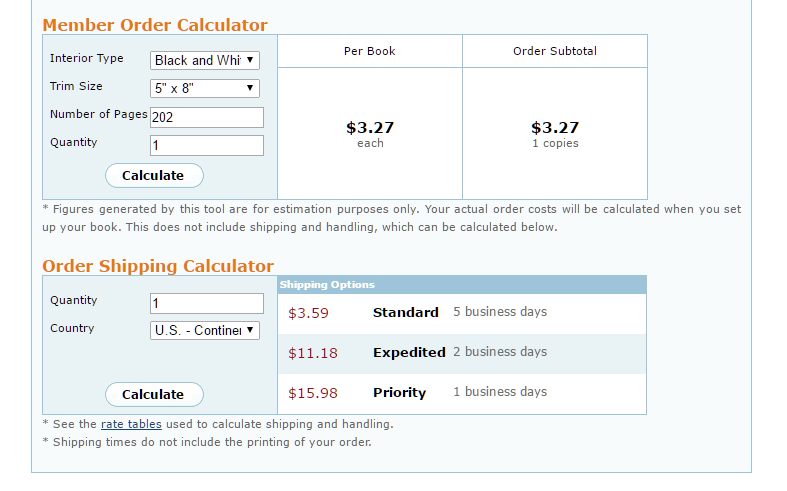 So you have to go to the “Buying Copies” tab to see the printing cost of your book and the shipping cost. 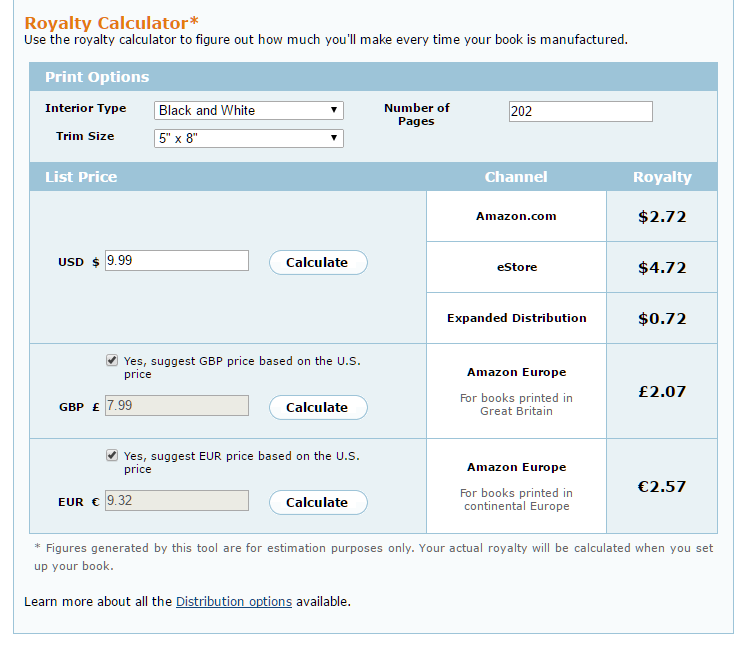 The “Royalties” tab lets you see the royalties that you will pay to have your book promoted on Amazon or sold directly through CreateSpace’s storefront. A 202 page 5×8 book with a black and white interior on cream paper will cost $3.27 to print and $3.59 for standard 5-day shipping. If you are ordering a quantity of 1000+ books, you can call and inquire about getting a reduced rate. With a retail price of $9.99, you will receive $2.72 per copy pre-tax if sold through Amazon.com. So for our sample 202 B/W book, you are charged $.012 per page, which is $2.42, and then charges a fixed cost of $.85. On top of that number you ALSO have the 40% that Amazon is charging (based on your retail price) for using its standard distribution channel. This works out to $9.99 (retail) minus $2.42 (page count cost) minus $.85 (fixed cost) minus $4.00 (Amazon’s standard distribution channel) equals $2.72 per copy sold pre-tax. 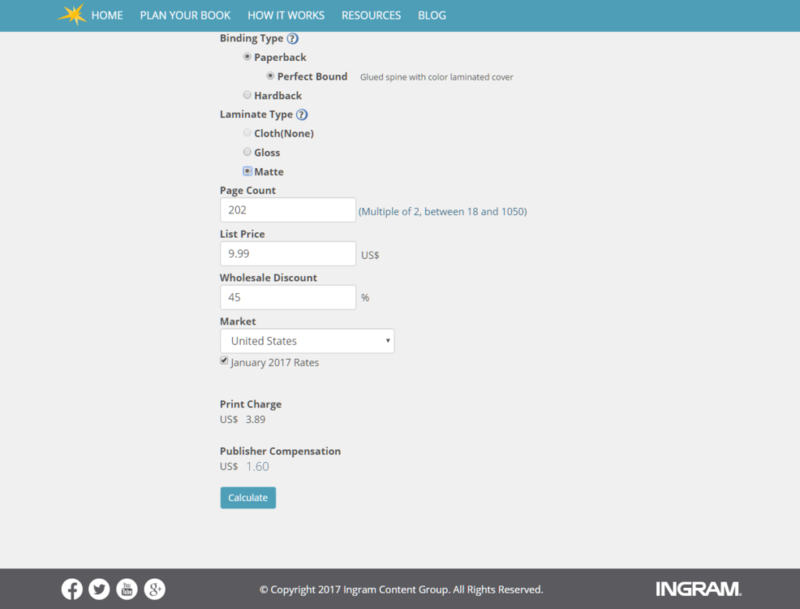 IngramSpark also has two different pages for their “buying copies” and shipping versus “royalties” formulations. They don’t use the term “royalties”, though. Instead, you will see a box for “wholesale discount”, which is anywhere from 40% to 50%, depending on the bookstore. This example will also use a 202 page 5×8 book with a black and white interior on cream paper. So if the retail price of your book is $9.99, the bookstore will want a 45% wholesale discount, which means they will buy your book for 45% of $9.99, which is $4.50. It’s going to cost you $3.89 to have the book printed. An additional $3.80 plus $1.85 handling fee ($5.65) will get you basic shipping for one book, totaling $9.34 for one printed and shipped book (direct cost to you, the author). So $9.99 (retail price) minus $4.50 (wholesale discount) minus $3.89 for printing costs leaves you with $1.60 per copy sold pre-tax. And because I was a business analyst long before I even had a dream of being a publishing services provider, I have put together a simple spreadsheet for you visual people.